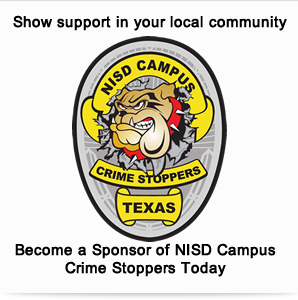 NISD Campus Crime Stoppers is a student engagement program to address juvenile related crimes, particularly criminal activity occurring in and around school campuses. 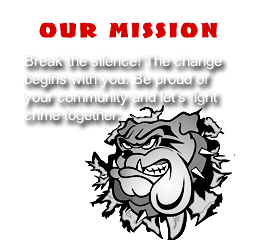 It is a joint effort between school Administration, students, staff, law enforcement and all of our surrounding communities to engage students to take active roles in keeping their schools and communities safe and free from the threat of violence, illegal drugs, weapons and other dangerous activities. The two criminals who shot down Michael Carmen at his gas station in July, 1976, didn’t realize that they would be responsible for a world-wide anti-crime movement that has resulted in the solution of more than 425,000 major crimes. They didn’t realize that as a result of their cold-blooded killing, more than 75,000 criminals would find themselves behind bars. Nor did they realize that their crime would become the model of two major television network shows. 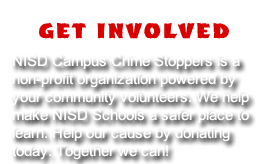 No, the two criminals who shot Michael Carmen at point-blank range with a .12-gauge shotgun did not realize that their crime would serve as the catalyst for the creation of Crime Stoppers. Michael Carmen was a young University of New Mexico student who was working at a small gas station in Albuquerque’s Northeast Height in July 1976. He was only two weeks away from marrying his high school sweetheart. On the night he was killed, he was working an extra shift because one of his friends needed the night off. On that fateful Friday night, two men robbed Michael’s gas station and then — for no apparent reason — fired a shotgun blast from less than 10 feet into his abdomen. Remarkably, Michael lived for more than four hours after the shooting. Several times he tried to tell detectives who shot him, but he didn’t have the strength. He died on the operating table without being able to make a dying declaration. Detective Greg MacAleese was one of the detectives working that case. The murder seemed so senseless at the time. It still remains senseless today. But Detective MacAleese told Michael’s mother that they would bring his killers to justice. And yet, after six weeks of trying to piece evidence together to solve the murder, they were no closer to a solution than they were the night he was killed. It was really out of desperation that Det. MacAleese approached Max Sklower, then general manager of KOAT-TV in Albuquerque, and asked him if they could reenact the crime for one of his newscasts. The reasoning for reenacting the crime was simple. They had an eyewitness to Michael’s murder somewhere in the community. The only logical approach was to get the media to do it for them. If they reenacted the crime, they might be able to trigger the memory of a potential eyewitness, someone who might have seen part of the crime committed but not understood what he or she was witnessing. On September 8, 1976, the first crime reenactment was broadcast on the news. The next morning they received a call from a young man who told them that he had watched and remembered some very important information. The case was solved and Crime Stoppers was born.